When it comes to resources, it can be hard for companies to delegate certain aspects of their business. This is especially true where data and IT is concerned. However, keeping eveything related to your data in-house also places a huge burden on internal teams and finances. So, in today’s blog, we’re examining some of the reasons your organization should re-evaluate and give cloud-based data warehouses a try. With a cloud-based data warehouse, the performance of existing workloads doesn’t suffer due to ad-hoc and parallel queries that are on the same data set. This makes it possible for consumers to continue exploring the data with minor limitations if any. Another advantage for the end user stems from simplified data ingestion mechanisms while ELT processing minimizes the responsibility placed on users regarding the maintenance of complex ETL pipelines. End users are also able to deploy multiple queries in tandem across terabytes of data without a delay in the response. One of the most significant advantages of relying on a cloud-based data warehouses is that they almost always split storage and computing in order to support asynchronous replication of the storage over different regions, all while avoiding any impact on the existing compute resources and queries. This is of course in addition to the backups and snapshots that are automatically taken and made available within any given region. There is also the fact that certain vendors are able to offer their own private backend networks across regions to further increase security and reliability, reduce latency, and improve availability with little to no data loss throughout the recovery process. Should a disaster occur, this cross-region replicated data can be instantly put to work by means of spinning up processing capacity where availability ranges between instantaneous to a couple minutes of ramp-up time. There is also the benefit of certain systems supporting immediate querying of some of the data while the remainder is loaded seamlessly behind the scenes. When entrusting a cloud-based data warehouse provider, there is significantly more flexibility to grow your storage independently of compute resources. This enables large volumes of data to be ingested while bypassing any associated compute costs. Opting for a cloud-based data warehouse also makes it possible for organizations to scale rapidly based on fluctuations in data growth. With intuitive dashboards and APIs your controls are easy to access, and organizations are no longer forced to prepare their procurements in advance or stress over space constraints. Another advantage of a cloud-based data warehouse is that they tend to support multiple data types, particularly those that are lacking in structure, like CSV, for example. The querying of unstructured data can even be supported on external storage. Due to this support, cloud-based data warehouses are well-equipped to handle the semi-structured and unstructured data that is typical of big data workloads. For big data workloads, there is also the fact that the majority of cloud-based solutions provide longer term cold storage options in which the data is easily accessible at a lower storage cost. With a cloud-based data warehouse, data at rest is encrypted using hardware accelerated AES-128, at minimum., while data in transit is TLS encrypted. Additionally, cloud-based data warehouses offer support for virtual private networks including connectivity to on-premise networks that use industry-standard IPsec VPNs. For a company to attain this level of managed security infrastructure they would need to hire a dedicated in-house team, and even then, it would be incredibly difficult for them to reach the level of sophistication and ease of applying the security controls that are achieved in a cloud environment. When it comes to billing, cloud-based services use the same economic model as data centres – users are charged on a pay-per-use basis. Another benefit is that businesses can reduce their hardware costs by preventing hardware expansion and reduce their maintenance burdens by practically eliminating the costs associated with personnel, licenses, and hardware replacements. 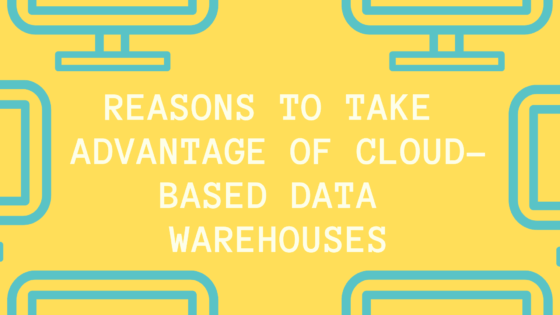 In taking a step back, and evaluating just some of the advantages that cloud-based data warehouses have to offer, it’s easy to see how beneficial the switch can be. Don’t let intimidation or the unknown stop your company from advancing, get in touch with the experts at VEXXHOST today and let us help you determine the best strategy and solution for your business!